Pure and cross-bred Piemontese animals providing a superb eating quality with the additional benefit of having a naturally low saturated fat, cholesterol and calorie content. To purchase a beef box please add your prefered box below to your shopping cart. Payment is made securely through PayPal. Delivery is made directly by Jenny's Beef Ltd if local or by 24 hour courier, with the meat packaged in special, environmentaly friendly, wool insulated boxes to ensure freshness. Due to the nature of the product and to ensure freshness our beef boxes are delivered subject to slaughter dates, typically within 2 weeks. 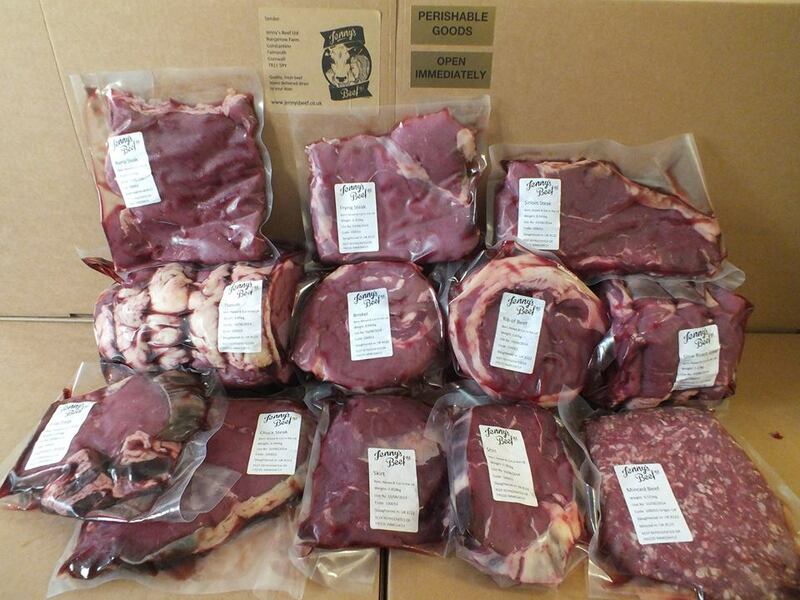 We never freeze our beef, it will arrive to you in chilled vacuum packs and is suitable for home freezing. For this reason a delivery date will be confirmed at point of order. Due to the butchery process and every animal slaughtered being unique the boxes may not be exactly to the specified weight and contents may change due to availibility. We will always substitue for a greater value cut / increased weight of box. Delivery within TR1, TR3, TR4, TR5, TR10, TR11,TR12, TR13, TR14, TR15, TR16 Postcodes.Pre-orders now being taken. 10kg of beef. A selection of cuts from across the whole carcass. 5.5kg of beef. A selection of cuts from across the whole carcass. Perfect for couples and those with limited freezer space. 15kg of beef. Cuts representing the whole carcass. A great buy for families and those with spare freezer space. Roasting Joints, Steaks, Mince and Stewing Steak. A beef box containing a mixture of fantastic value beef cuts for making those hearty stews, tasty bolognases, slow roasts and quick fry steaks. 7.5kg of Premium Joints and Cuts.